Beasts of Tarzan was written by Edgar Rice Burroughs. 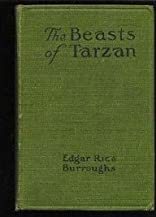 Beasts of Tarzan was published by Benediction Classics. About Edgar Rice Burroughs (Author) : Edgar Rice Burroughs (September 1, 1875 – March 19, 1950) was an American author, best known for his creation of the jungle hero Tarzan, although he also produced works in many genres.